Don’t miss these great deals! Simply visit any of the businesses below and present your Buy Local Value Card for instant savings! The Chamber's mission is to positively impact our community and members by facilitating tourism, economic and cultural development in Union County. One way we do this is through our Buy Local Program. The purpose of this program is to help promote our member businesses while making it easy for those who live, work and do business in and around Union County to support our local businesses. 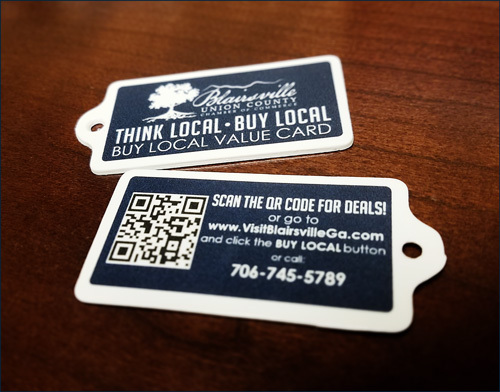 The Buy Local Value Card is a free discount card for you to add to your keychain. Show the keycard at participating businesses for great deals. On your keyring, it will always be with you. The more you use it, the more you save! Come by the Chamber and pick up your free Value Card! Sign up for our Buy Local Deals eNewsletter and you will receive an email notification when new Buy Local Deals are added to our website. $20 Off All Full Body Mud Wraps throughout the month of April at Paradise Hills! Take advantage of this special offer throughout the month of April! The Buy Local program is a campaign of the Blairsville-Union County Chamber of Commerce and community partners. Our mission is to support local businesses in Blairsville-Union County, to maintain our unique community character, attract tourism, and build economic strength.